(Left) James Corden. (Right) Ariana Grande. 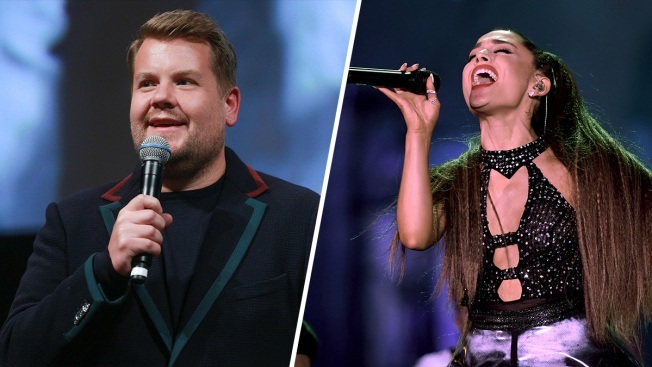 Ariana Grande joined James Corden on "The Late Late Show" Monday night for a fast-paced rendition of "Titanic," the five-minute musical. They managed to sing 13 songs in just one take. Highlights include Grande channeling Kate Winslet during Styx's rock ballad "Come Sail Away," and James Corden depicting Leonardo DiCaprio's leading man role as he serenades Rose with the Hall & Oates hit "Rich Girl." Grande took center stage for the grand finale to belt out a moving rendition of Céline Dion's "My Heart Will Go On."